22 New York Athletes to Compete in Winter and Paralympic Games in February. Albany, NY - January 30, 2018 - Governor Andrew M. Cuomo today announced that 22 athletes from New York State are set to compete in the 2018 Olympic Winter Games and Paralympic Games in PyeongChang, South Korea. "With 22 world-class athletes calling the Empire State home, this year's Olympic Winter Games are a true source of pride for New Yorkers across the state," Governor Cuomo said. "I congratulate these Olympians for their achievements and encourage New Yorkers and their families to tune in and cheer on these great athletes as they compete with Team USA in PyeongChang this February." Tommy Beisemeyer (Keene): A first-time Olympian, Beisemeyer started skiing at Whiteface Mountain when he was three years old. Beisemeyer started skiing competitively when he was 12 years old and won the overall NorAM Cup title in 2010. Andrew Weibrecht (Lake Placid): Weibrecht is looking to complete his Olympic medal collection. Eight years ago, he raced to a bronze medal in the men's Olympic Alpine Super-G and four years after that he won silver, in the same event. A gold medal in PyeongChang caps off the collection. Weibrecht is just one of five American skiers to have won multiple Olympic alpine skiing medals. Others on that list include Bode Miller, Ted Ligety, Tommy Moe and Phil Mahre. Lowell Bailey (Lake Placid): Last winter, Bailey, a four-time Olympian, won the 20km World Championship crown, becoming the first American to ever win a world title. He also became the first athlete named to the United States' 2018 Olympic team. Tim Burke (Lake Placid): Burke, also a four-time Olympian, has been one of the sport's top athletes. He has notched several World Cup podium finishes and at the 2013 world championships, he won a silver medal in the 20km individual competition, becoming the second U.S. man ever to win a world championship medal. Maddie Phaneuf (Old Forge): Phaneuf began her biathlon career 2010 when she was 15 years old. She made her World Cup debut during the 2014-'15 winter season and now lives and trains in Lake Placid, at the Olympic Training Center. 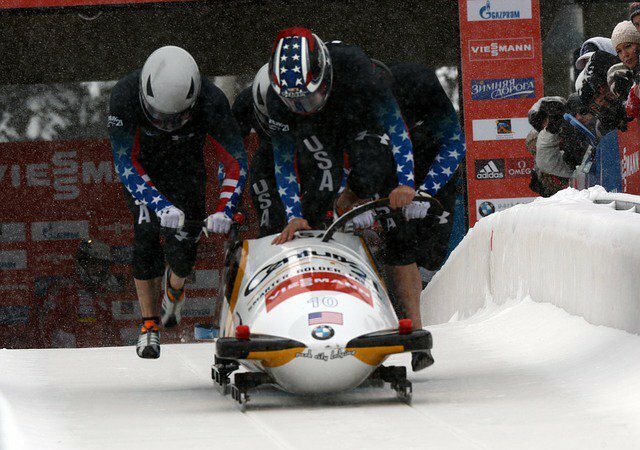 Jamie Greubel (Lake Placid): Greubel will try to become the first American woman to claim an Olympic gold medal in women's bobsledding. Just four years ago, she drove to a bronze medal finish in Sochi. She began her sliding career as a brake-woman, before moving to the front of the sled where she has driven to not only an Olympic bronze medal, but also a world championship bronze medal and several World Cup podium finishes. Morgan Schild (Pittsford): Schild won the 2015 FIS Rookie of the Year Award in women's moguls, and is making her Olympic debut. Jon Lillis (Rochester): Lillis is the reigning men's aerials world champion. He also completed the 2017-'18 World Cup season ranked 10th overall, best amongst all U.S. athletes. This year marks his Olympic debut. Matt Gilroy, Defense, (North Bellmore): Gilroy won the Hobey Baker Award in his senior season at Boston University and co-captained the Terriers to an NCAA championship in 2008 - '09. Brian Gionta, Forward, (Rochester): Gionta is a two-time Olympian and won the 2003 Stanley Cup with the NHL's New Jersey Devils. He also holds the Devils' record for most goals (48) in a single season, in 2005 - '06. Jordan Greenway, Forward, (Canton): Greenway is appearing in his first Olympics. He was selected by the Minnesota Wild in the second round (50th overall) of the 2015 NHL Draft. David Leggio, Goalie, (Williamsville): Leggio, a first-time Olympian, played his collegiate hockey at Clarkson University and was named the ECAC Goaltender of the Year during his junior season. He also led the Golden Knights to consecutive NCAA Championship tournament appearances, in 2007 and 2008. Emily Pfalzer, Defense, (Buffalo): Pfalzer is a two-time Four Nation's Cup gold medalist and a 2017 world champion. Erin Hamlin (Remsen): Hamlin is a four-time Olympian and became the first American singles luge athlete to win an Olympic medal when she raced to bronze in Sochi. Justin Krewson (Eastport): Krewson is making his Olympic debut. He is a two-time junior world championship medalist and the 2014 U.S. junior doubles luge national champion. Chris Mazdzer (Saranac Lake): Mazdzer is looking forward to his third Olympic Winter Games. In his previous two Olympic races, in 2010 and 2014, he has a pair of 13th place results. He has become one of the United States' most accomplished sliders with seven national championship titles and 10 World Cup medals to include the 2015-'16 overall World Cup bronze medal. Matt Mortensen (Huntington Station): Mortensen is returning to Olympics with a new doubles partner, Jayson Terdiman (Berwick, Pa.). In 2014, he and his teammate, Preston Griffall, finished 14th. Mortensen and Terdiman are the reigning luge World Cup overall bronze medalists. John Daly (Smithtown): Daly is headed to his third Olympic Winter Games. Daly began his men's skeleton career in 2001. "Once again, Team USA is among the largest teams to compete in the Olympic Winter Games, and we continue to see a spike in excellence from Americans competing in winter sports as the sport program expands to include more opportunities for our athletes," said Alan Ashley, U.S. chef de mission and USOC chief of sport performance. "We are primed and ready for another strong showing from our athletes, who have made a long-time commitment to represent us as the best in the U.S. at these Games, and we look forward to cheering for each member of Team USA, including these amazing men and women from New York, on the world's greatest stage." To find out more about the entire 242-member 2018 U.S. Olympic team and the Paralympic team, visit www.TeamUSA.org. Subject: LongIsland.com - Your Name sent you Article details of "Governor Cuomo Announces New Yorkers Selected To Compete On Team USA In 2018 Olympic Winter Games"